Even if he hadn’t been blessed with a naturally sunny disposition, Ally McCoist was never short of reasons to be cheerful during his playing career at Rangers. Putting the ball in the net was a serious business for McCoist but a grin was never far from his face as he became the Ibrox club’s all-time record scorer. So when he assesses Alfredo Morelos, the man currently shouldering the responsibility of being Rangers’ main striker, McCoist believes it is time for the Colombian international to lighten up. Morelos again underlined his value to Steven Gerrard’s side on Saturday when he grabbed his 14th goal of the season in the 2-0 Premiership victory at St Mirren. McCoist is appreciative of the 22-year-old’s ability but admits to being perplexed by the almost permanent scowl with which he goes about his work on the pitch. It is a negative demeanour which perhaps contributes to a disciplinary problem which has seen Morelos collect nine yellow cards and be sent off twice already this campaign, albeit with one of the red cards being rescinded. He has already served suspensions in both the Europa League and Betfred Cup, the latter coming at a cost to Rangers who felt his absence keenly in losing 1-0 to Aberdeen in the Hampden semi-final. McCoist feels Morelos can become the 30-goal a season striker Rangers need to reclaim their status as a trophy-winning side in Scotland if he can clean up his act. “There are goals in him, no doubt about it,” said McCoist. “I’d just like to see him enjoy his goals a bit more. I’d like to see him smile when he scores and be happy about it. 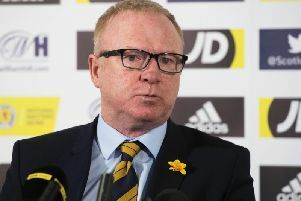 “The discipline issue is also something he needs to work on, because it was glaringly obvious that he was massive loss to Rangers in the semi-final. “We’ll never know, but Rangers certainly had enough of the ball that day to think they would have created one or two chances – and Morelos is the best finisher at the club. “His goal at the weekend sums him up. That is his kind of finish. He let’s the ball go through him and always does the right thing by going across to the far side of the goalie. • READ MORE - Does Alfredo Morelos get the credit he deserves from the Scottish media? “The Old Firm clubs should always have a 25 to 30-goal a season striker. Morelos has got the talent to be that striker, no doubt about it. But he obviously has to keep himself fit and stay on the pitch. “He picks up silly bookings, for petulance. If he can just get that out of his game, it would make a big difference. Morelos could be a key figure for Rangers on Thursday night when they face Spartak Moscow in Russia in their latest Europa League group stage fixture. Gerrard’s side are firmly in contention to qualify after picking up five points from their first three games, away to Villarreal (2-2) and at home to Rapid Vienna (3-1) and Spartak (0-0). McCoist, whose record tally of 21 European goals for Rangers included a hat-trick on Russian soil in a 7-2 Champions League qualifying win over Alania Vladikavkaz in 1996, will be at the Spartak Stadium on TV punditry duty. “This will be a test for Rangers, but they came through their previous away game in Villarreal really well,” he said. “They will need that type of performance again to get something in Moscow. They will need to defend well. “Without being brilliant, I thought Rangers should have won the home game against Spartak. Again, in front of goal they struggled a little bit. “They scored two really good goals in Villarreal but they also defended fairly well and the goalkeeper made a couple of great saves. “That will have to be the case again and make sure they take any chances that come their way. Opportunities are harder to come by in these games. Former Rangers manager McCoist has been impressed by Gerrard’s initial spell in the job which saw him hit his most difficult spell last week with dropped points at home to Kilmarnock following the Betfred Cup exit against Aberdeen. “It was always going to happen,” added McCoist. “If you’re at the Old Firm and don’t win for two games, people start asking questions. But Steven has handled it well and Rangers have definitely improved this season. • Ally McCoist was speaking at the launch of the Kris Boyd Testimonial at 1pm at Rugby Park on Saturday 17 November.Tickets are from £5 to £10. Buy online at www.kilmarnockfc.co.uk or call 01563 545310.